A cute farm-to-table style restaurant in the Longfellow neighborhood of South Minneapolis. I was elated when Chad made a spontaneous reservation to eat at The Craftsman on a recent visit to the Twin Cities. We have heard the buzz and read many favorable blogger reviews. They had us intrigued. The Craftsman is a mission style eatery featuring local, organic, and natural ingredients which are used to create its seasonally changing menu. The restaurant is located on East Lake Street is South Minneapolis. At first, I was concerned with parking as there is no real parking lot, but upon arrival we found plenty of parking on the residential streets. The cute Arts & Crafts style building fit in well with the neighborhood. Inside we were greeted by the hostess in the bar area and shown to our seats quickly. 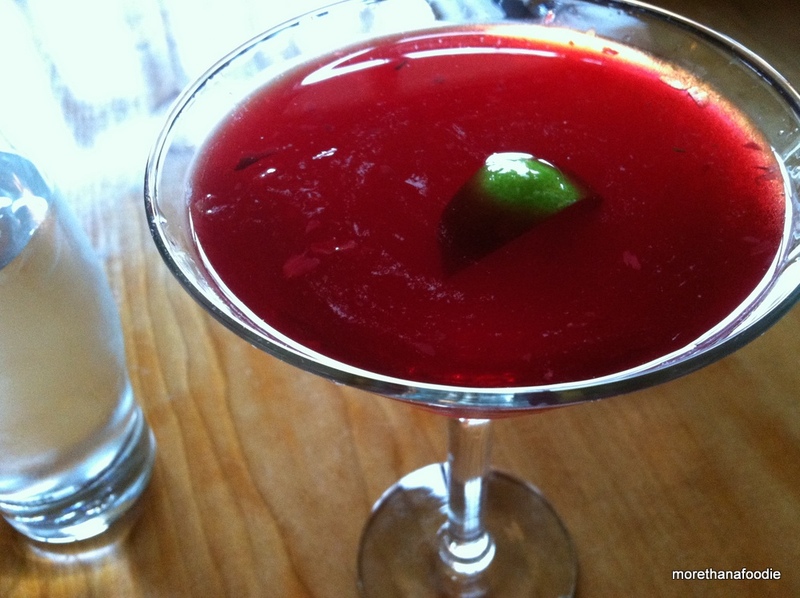 I ordered the Beet Martini. Wow! If you are a fan of beets you need to try. The flavor and color of this unique root vegetable was captured perfectly in this drink. Chad enjoyed a lovely Cherry Sidecar made with apple brandy before the dinner. The bar here definitely knows what they are doing. 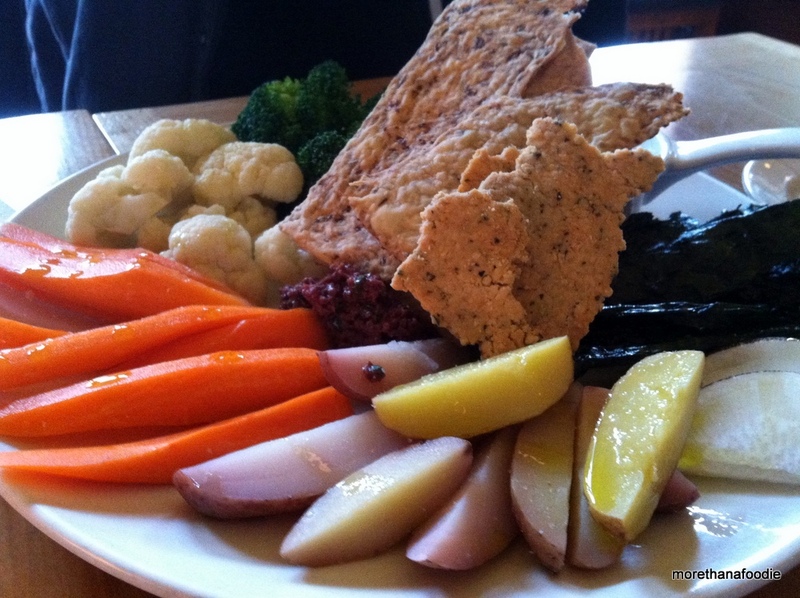 We started with the Hummos with black olives, vegetables and crackers. Upon my first glance, I knew we made an excellent choice. The plate was beautifully presented with perfectly attended vegetables drizzled with olive oil, hummos, and house made crackers. Everything was a pleasure to eat. Ooooh… and lets not forget the delectable kale chips. Who knew green crispy kale could be so yummy? I could have eaten the whole plate alone for my entrée, it was that marvelous. 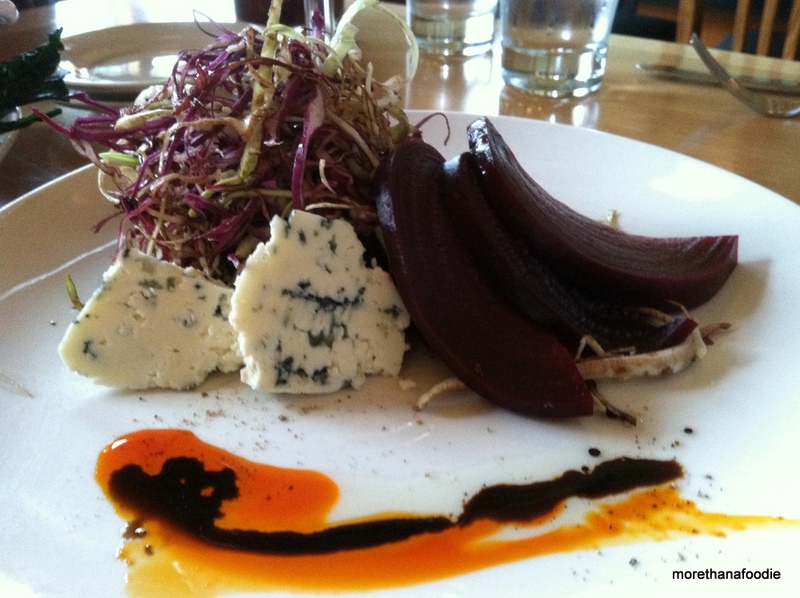 Secondly, we shared a blue cheese and beet salad. It was a bit of deconstruction, but it made eating it more of an adventure. One bite of beet, one bigger bite of cheese, a bit of it all at once. It gave us time to explore the flavors and enjoy the dish. Ah, the duck. Possibly the most amazing duck we have eaten, ever. 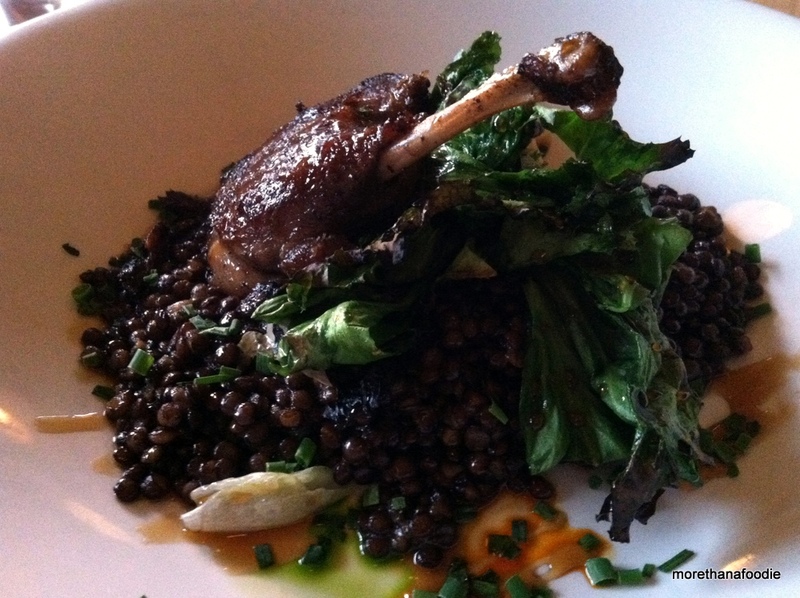 Duck Confit and Lentils. I will be honest, in the past I have never really been a fan of duck. I associated duck with really fatty, gamey tasting meat that could never possibly be good. I have since learned that duck can be delicious! Especially when you cook the meat in all of the rendered fat making it a confit! This duck was juicy, tender, and left you craving for more. The creamy, snappy textured lentils accompanying this dish made it a stunner. Notchi, Ganocci, Knoki, Gnocci, Noki…? No silly, it is gnocchi (nyawk-kee)! 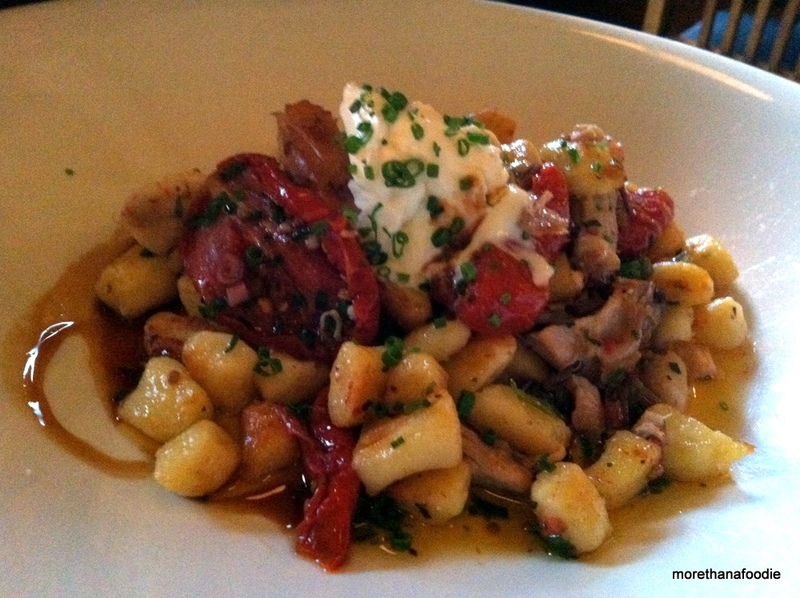 Specifically, potato gnocchi, smoked chicken, sun-dried tomatoes, and crème fraîche. It was impressive. We had other top-notch dishes, but this was the best! Full of flavor. You must try! 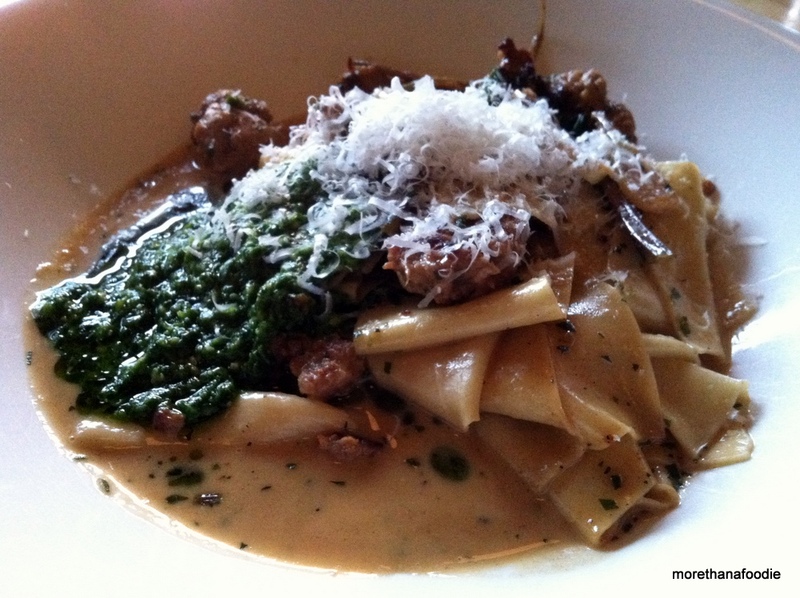 The pork tagliatelle with pesto and ramps was heavenly! 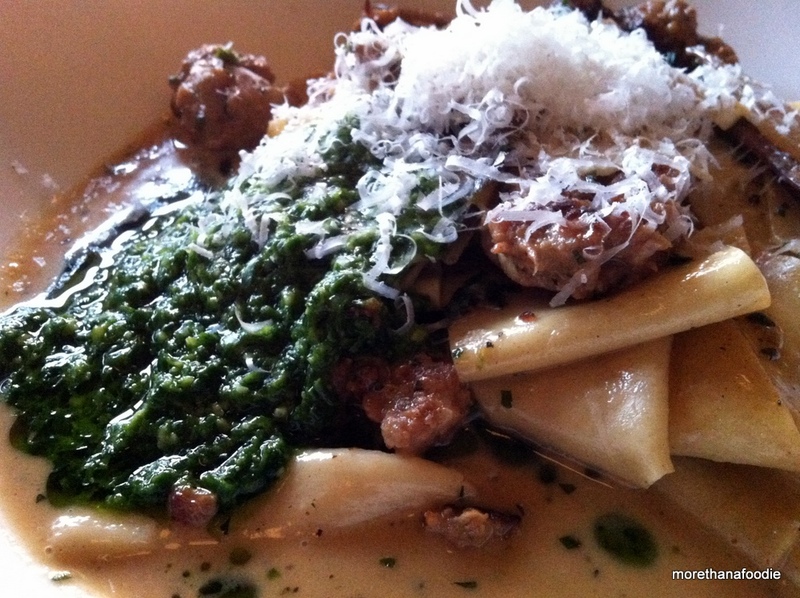 Super fresh, thick pasta with a tangy pork sausage and a basil pesto. Yum! We did have dessert, but unfortunately the pictures did not turn out. We had the apple crisp and we could not resist the Izzy’s Ice Cream. The apple crisp was a HUGE portion. The Izzy’s Salted Caramel did not disappoint, as usual. The service was very good. Our server was friendly, knowledgeable, and attentive. The water girl seemed a little aloof at first, but warmed up as the meal progressed. The space and decor is very clean, mission style with a hint of Frank Lloyd Wright. It is a nice place for a great meal, but it can tend to get a bit noisy due to the high ceiling heights. The restaurant is pricey ($13-$28 per entrée), but I felt totally worth it for the wonderful food. If you are looking for a great farm-to-table meal in the Twin Cities, check this place out. The Craftsman, 4300 East Lake Street, Minneapolis, MN 55406 – Update: 3/2018 – Sadly, The Craftsman has closed at the end of 2017.